Published in the Dover Express, 24 October, 1980. Perched under the brow of Military Hill Christ Church escaped the worst of enemy shelling and bombing during the Second World War but ceilings were brought down and all the glass blown out of the windows on the north and west sides of the building, destroying all the stained glass except that in the east window and baptistry. There was also a tragedy within the church, the verger being killed as he stood near the west gallery during one of the raids. In 1940 the New St. James' Church was destroyed, St. Barnabas Church was badly damaged and the old church of St. James reduced to ruins. Salvaged from the old church were a number of gifts of the Mowll family, an altar, communion rails, choir stalls, reading desk and the West window and, on the instructions of Archbishop Mowll, of Sydney, Australia, these were presented to Christ Church. The erection of the window at Christ Church required the removal of two adjacent lancet windows since the “new“ one was in the “decorated“ style. The planned induction of a new vicar of Christ Church on 9th September, 1940, had to be postponed due to enemy shelling. The service was held the following Wednesday instead but was attended by less than a dozen people. The following Sunday a customary reading of the thirty-nine articles was also interrupted, this time by a bombing raid, and the ceremony had to be continued in a cave shelter at the back of the church. During the following winter the church was closed for services which were held in the school room instead. On one occasion Holy Communion had to be taken in the basement there due to more cross-Channel shelling. There developed a regular series of services in the cave shelters of the town. Christ Church school room was opened at one stage of the war as a canteen for the Forces serving in the garrison. The first perpetual curate of Christ Church, Mr Bates, from Liverpool, was a very popular speaker. He died in 1856. His successor also proved popular. He was the Rev Charles D. Marston, one of the Chaplains to Queen Victoria. He in turn was succeeded in 1862 by the Rev Richard Glover. During his stay at Dover Christ Church became a separate parish of "Hougham-in-Dover," on 26th January, 1865. Four years later Mr Glover exchanged livings with the Rev George Albert Rogers who stayed until 1883 when there was the row about pew rents and church repairs as a result of which he resigned. There were anonymous letters, false claims and, it is recorded, libellous statements to the Press. The Archbishop was moved to hold an inquiry as a result of which Mr Rogers was vindicated, but he did not return. After a gap of about twelve months the Rev George Everard was appointed to the living. Said to be a great supporter of the “under-dog“ he was also very popular with the children of the parish. By the time of his resignation, due to ill health, in 1893, the church had been put in good repair and a parish hall built. The next minister was the Rev Hugh Falloon in whose incumbency Christ Church dropped its Low Church attitude which had come close to non-conformity. Behind his back there were complaints to the Archdeacon of "Ritual Practices." Nevertheless the change of emphasis seems to have worked. The strength of his flock grew in numbers and he held the living longer than any previous incumbent, not retiring until 1911, when he was succeeded by the Rev John A. Armstrong. He was followed two years later by the Rev A. J. Chapman who retired in 1917. The same year the Rev Edwin B. Brown was inducted. During his first winter the church windows were blown out by enemy action. Six years later he was succeeded by a former missionary, the Rev E. J. T. Stanley, who led a campaign against the increasing influence of the High Church. He went as far as to refuse payment of the Diocesan quota on the grounds that part of it might be used to meet the cost of “Ritual Practices“ and he was involved in a verbal battle with the Archdeacon — and won. He also spoke vigorously against the Deposited Prayer Book in 1928 and his more outspoken comments figured prominently in the Press. In 1932, however, he returned, with his sister, to the mission field. Both were killed due to enemy action while returning to England in 1941. Minister from 1933-37 was the Rev W. H. Finney, From 1938-40 the Rev F. Martyn Cundy was incumbent and later vicars were the Rev W. F. Jenkins (1940-441, the Rev H. Mark Russell (1945-51), the Rev C. J. G. Mollan (1951-58) and finally, from 1960 until his retirement in 1973, the Rev Samuel J. Archer. Others who gave long service to the church include Mr Warren, who, for almost 40 years (1849-88) was church organist, Mr Taylor, who was also town organist and his sister. Miss Taylor, who also filled the post, doubling as choirmaster, for ten of her sixteen years' service. Christ Church, apart from its higher mission, was, like new St. James's, a valuable asset in the estimation of speculating builders. It transformed agricultural land into building sites, and gave enhanced value to property that had lain dormant since the Folkestone Road was opened in the year 1762. There was a King’s highway in this direction much earlier, mention being made In a Dover deed, dated 1274, of “1716 King’s highway which leads from Dover Priory as far as Stapingdune.“ From this, it appears that the ancient road, in this direction, went no further westward than the Elms corner, and then, passing the foot of Steppingdown, proceeded along the Elms Valley to Hougham. But the property mentioned in this deed was mere agricultural land, and it does not appear that there were, at that early date! any human habitations westward of the Priory, with the exception of the Manor House of the Lord of Maxton, and the Prior’s Manor House at Farthingloe. Most of the houses on St. Martin's Hill — that is, between Priory Place and Priory Gate — were built soon after Christ Church. The residences on the north side, up to Christ Church Vicarage, were all built in 1845, the backs of most of them being on the site of the Priory Church. 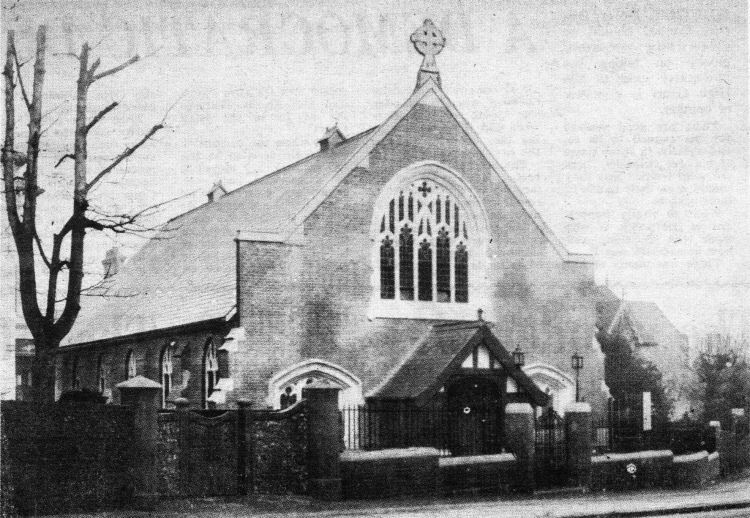 Twice destroyed by enemy action in successive world wars and subsequently rebuilt Wesley Methodist Church, In Folkestone Road, which was long known as the Wesley Hall. It is pictured before its destruction by an enemy bomb on 24th September, 1917. On the right is the minister’s manse which was also badly damaged and subsequently pulled down. 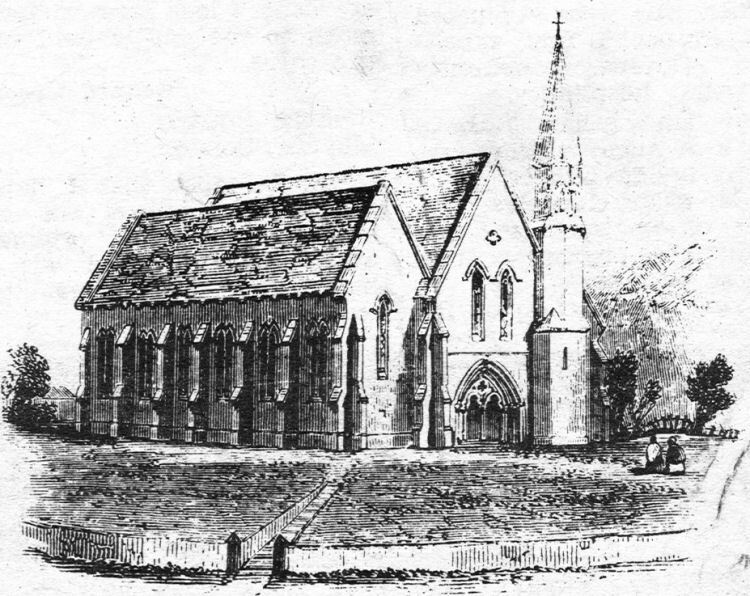 The picture above is an old engraving of Christ Church, on the opposite side of Folkestone Road, as it appeared soon after it was built.